After the disappointment of watching the Rockets fall apart against the Jazz for what seems like eons ago (last Tuesday), we knew they would come out strong against the Clippers Saturday night considering 1) they’re much better at beating teams they should beat given the changes to the roster during the All-Star break, and 2) all the practices they’ve been able to get in over the past 3 days might get rid of some of the bad habits they suddenly developed in Utah. Add in the fact that Marcus Camby and Baron Davis were out because of injury or health reasons, and it made it that much easier for the Rockets. The game was essentially over in the first quarter as Houston opened up a 30-12 lead, and won convincingly 110-93. Yao Ming shows Chris Kaman he still can’t stop him. Click here for more game photos. So who was the catalyst in that first quarter to open up a lead they wouldn’t relinquish? Aaron Brooks with 11 points on 5-of-8 shooting, which helped propel the Rockets to a 22-point second-quarter lead. But the Clips would go an on 11-2 run late in Q2 to cut it to 49-36, and you had to think the Rockets were in for more of a dogfight the rest of the way. But Brooks would close out the quarter hitting two 3-pointers sandwiched around a Luis Scola bucket, capping a 9-0 run. That gave them a commanding 57-36 lead heading into halftime. A.B. would lead all scorers at that time with 17 points on 7-of-11 shooting, including 3-of-5 from three-point land. Is having a point guard who can score such a bad thing? Brooks wasn’t all alone, though. Yao had an excellent half himself with 15 points on 5-of-8 shooting, hit all 5 of his free throws, and grabbed 12 boards. He would only need to take 3 more shots the rest of the way, finishing with 21 on 7-of-11 shots, 7-of-8 from the line, 15 boards, and no turnovers! It was obvious the Rockets had worked in their recent practices on getting Yao the ball in different positions. They seemed more organized and methodical in their half-court sets. I like that phrase, “get the ball to Yao, kind of on the move.” I just wish it hadn’t taken this long. That’s been obvious to me for quite some time. Except for some ill-advised 3-pointers from Ron Artest (1-for-4 from 3-point land in the first half), who seems at times NOT to get the idea of shooting high-percentage shots a la McGrady, Houston executed well against an undermanned and less experienced Clipper team. But unlike McGrady, just when you think Artest is going to completely implode the entire night, he’ll actually start hitting those threes! Artest would hit 2-of-2 the rest of the way to finish 3-of-6 from behind the arc, and close out the game with 13 points on 5-of-16 from the field. Although Artest has struggled from the field the past 2 games, Shane Battier has picked up the slack, going Saturday night a perfect 4-for-4 from the field with 2 treys, along with a couple of nice moves in the low post. 15 points, 4 boards, and 4 assists for Batter makes you think the Rockets’ chances in the playoffs will lift significantly if this holds up. I don’t really mind Artest scoring only 13 points in this game if he doesn’t go hog-wild with too many shot attempts (like the 22 he attempted in Utah), because it does lend to more balanced scoring. Six different Rockets scored in double figures: all the starters, including Luis Scola (13 points on 6-of-9 shots), plus Von Wafer, who bounced back nice from the Utah game with 11 points on 5-of-8 shots. All of this led to Houston opening up a 30-point lead in the third. You just hoped no one would get hurt as the Rockets closed it out and looked to Phoenix on Wednesday night. I couldn’t help but resist and shift my attention to the Phoenix-Utah game being played. Not only to see how Phoenix is playing before the Rockets play them on Wednesday, but to see if Utah could lose to drop in the standings and hopefully distance themselves from a 1st round matchup with the Rockets in the playoffs. Phoenix looked like they were no match as they fell behind by 21 points in the third, and trailed 11 points entering the fourth quarter. Being behind late IN UTAH for any team…well, you might as well as shut it down. But to my amazement, Phoenix came back and even took a seemingly insurmountable 7-point lead with about 2 minutes remaining in the game. But some stupid mistakes, like Grant Hill fumbling a pass out of bounds with less than 30 seconds remaining, gave Utah new life and a chance to tie it up, WHICH DERON WILLIAMS DID to send it into overtime! Then in OT, Hill would foul Kirilenko on a 3-pointer, turning it into a 4-point play and giving the Jazz the momentum they needed to pull out a miracle win. Jeez, it seems like no one can put Utah away in their own gym! So if you’re a frustrated Houston fan who hates the Jazz, don’t worry. You’re not alone. It’s still way too early to determine if this victory gets the Rockets one step closer to playing the Jazz in the first round. That’s because the teams are so bunched up, each game the standings change. The chart below explains it better than I can. Keep in mind #4 and #5 play each other, as do #3 and #6, and #2 and 7. I’m going to do something that I rarely do. Because I have to wake up early in the morning, I’ve got to make this short. So I won’t be commenting much about the Rockets victory over the LA Clippers Wednesday night. They did what was expected of them, and that can’t be taken for granted compared to previous Rocket teams that underachieved in the past. So kudos go to them for taking care of business. Luis Scola led the way with 22 points. Now we know they’re going to play the Jazz in the first round, and will have homecourt advantage in that series. What a relief! Thank you San Antonio (for once)! This time last week, I was hoping the Rockets would be a 1st or 2nd seed in the West which would match them up with Denver or Dallas. But I’ll take a first-round matchup against the Jazz. I’d much rather play them than the Suns or Spurs, which would be happening if they were the 3rd or 6th seed, respectively. If that had happened, I would have been pissed. It reminds me a little bit when the Rockets had such a hard time beating the Sonics in the early to mid-1990’s, but finally beat them in a playoff series after acquiring Charles Barkley. It took awhile, but they finally made the adjustments to beat that team. Hopefully everything the Rockets did in the off-season in getting more athletic power forwards – Luis Scola and Carl Landry, an improved Rafer Alston (hopefully he can play starting in Game 3), speed in the backcourt (Aaron Brooks), and a veteran point guard (Bobby Jackson) will be enough. After seeing earlier in the day the Phoenix Suns blow a 13-point lead in the fourth quarter to the Mavericks and lose, that had to give Houston even more reason to take care of business in LA Sunday night. 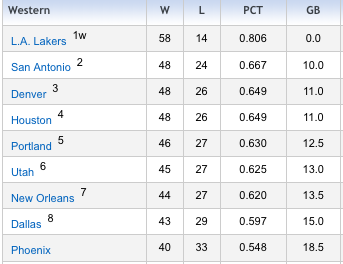 A win against the Clippers, and Houston could move one full game ahead of Phoenix for the 5th playoff spot in the West, and one game behind San Antonio and the Lakers for second or third place with 5 games to play. So the Rockets came into Staples Center and put together one of their most complete games since the 22-game winning streak, beating the Clips 105-79. It’s exactly what they need to get in a playoff mindset. It didn’t hurt that the Clippers have been injury-riddled the entire season, with more games missed by players than any other team this season. With Chris Kaman and Shaun Livingston out for the season, Elton Brand playing just his third game of the season after missing most of it because of Achilles surgery, and their leading scorer (22.5 points) Corey Maggette having to leave the game early for good with a strained hamstring, they really had no chance. Meanwhile, Houston’s offense started off hot as the Rockets made 11 of its first 19 shots to take a 30-20 lead. That 10-point lead was an important milestone since the Clippers are only 7-47 this season when they fall behind by double-digits. After that point, the Rockets were never really threatened as they built a 20-point lead by halftime, 62-42. Hitting 6-of-11 three-pointers was a key to building that lead compared to LA’s 1-of-3 (that one three-pointer is all they would make for the entire game). The Clips would cut it to 13 points in the third quarter as Houston’s offense stagnated with only 18 points in the quarter. But Houston’s reserves did an admirable job in the fourth, surging the lead back to 20+ points to show the Rockets’ offense is getting tuned for the stretch run. Houston’s offense was firing on all cylinders as 6 players scored in double-figures, led by backup point guard rookie Aaron Brooks. On the bench for so long after the acquisition of Bobby Jackson, Brooks has shown the past couple of games he hasn’t missed a beat. AB used his speed and ability to get into the lane (or to the hole) in a flash, hitting 7-of-9 from the field and 2-of-3 three-pointers to score a game-high 18 points. He also had 4 assists and zero turnovers. Houston’s point guard future is bright. Yao Ming shoots a jump hook over LA Clipper Chris Kaman on Monday, November 26th in Los Angeles in an 88-71 Rockets win. Yao finished with 14 points on 5-of-11 shooting, 8 rebounds and 1 block. Meanwhile, Kaman came out strong and scored 22 points on 7-of-20 shooting, and 13 boards. Click here and here for more photos from the game. Well, we’re going to have to wait at least another game to see if the Rockets’ renewed emphasis on ball movement will be effective. Despite Rick Adelman‘s vow to not lean on Yao Ming and Tracy McGrady (especially) to have so much of the scoring load placed on their shoulders, in the second half he absolutely threw that philosophy out the window Monday night in a victory over the hapless LA Clippers. In the third quarter when the Rockets finally got some separation from the Clippers due to them missing tons of shots (Sam Cassell’s injury in the first quarter really hurt their cause), they just kept feeding McGrady who put the entire offense on his shoulders by scoring 9 points in the third, and 19 in the fourth. This was quite a change from their commitment in the first quarter when I thought McGrady did a good job taking it to the hole and not settling on jump shots. In the second half, I can understand the philosophy of “feeding the hot hand,” but this was ridiculous. There was no ball movement at all – just McGrady going one-on-one as he scored 28 of the Rockets’ 48 second-half points, and 36 overall. Where is the commitment and the will power to stay the course, and not to be tempted to go back to the “old way” of scoring points (which we know doesn’t work in crunch time), and work out the kinks in the new system? 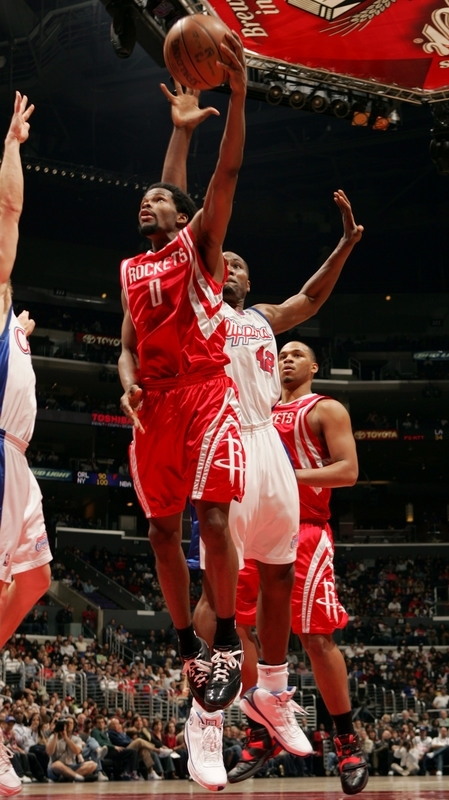 Yao makes a spin move to the baseline on the LA Clipppers’ Chris Kaman Wednesday night. Yao finished with 24 points and 15 rebounds, including 3 rebounds down the stretch to help seal a close 92-87 victory. Click here for more photos from the game. The Rockets game against the Clippers Wednesday night was one of the more entertaining games of the season, a 92-87 victory for Houston. But I admit it: if Houston had lost, you would hear me moaning and complaining, and I would NOT be saying it was entertaining. There were lots of runs by both teams to keep it close whenever you thought one of the teams was going to pull away. Even though he finished shooting below 50% for the game (12-of-30), Tracy McGrady was fantastic, having his way whenever Cuttino Mobley tried to guard him. In the first quarter alone, T-Mac must have taken Cuttino to the hole 4 different times and scored on him each time. As T-Mac would say, “my man was at my mercy.” He just blew by him, and continued to do it. And Mobley is a pretty good defender. Just goes to show how dominant T-Mac can be. Houston got off to a hot start in that first quarter by taking a 17-9 lead, with T-Mac scoring 8 of those points. But then the Clippers went on a 20-4 run to hold a 29-21 lead after the first quarter. Then early in the second quarter, Yao picked up his third foul. But like in a recent game where Yao was burdened by foul trouble early, he stayed in the game and made the most of it. He even got more aggressive offensively and scored the Rockets’ next 8 points by hitting a hook shot, throwing down a dunk, hitting a jump shot, and making two free throws. That stretch by Yao kept the game from getting away and made it 33-31, Clippers. The jump shot he hit in the middle of that run was a thing of beauty. He did his favorite spin move to the baseline on Chris Kaman, but then stopped his dribble (creating space on Kaman since Yao’s defenders are accustomed to following Yao to the basket), faded away to make the shot unblockable, and drained it. I hadn’t seen that move before from Yao. I guess Yao knows everyone is watching videotape of him on that spin move and is throwing in a new wrinkle to get himself an easier shot. Yao Ming prepares to make a strong move against the Clippers’ Elton Brand Wednesday night. Yao scored 14 points on 6-of-13 shooting and grabbed 6 boards…nothing special statistically. But his presence down low continued to open up opportunities for other Rocket players, and he had a key steal late in the game to help pull out a clutch win, 109-105. Click here for more photos from the game. The Rockets blew a big lead again, this time Wednesday night against the Clippers. We’ve become accustomed to that this season. The difference this time around was that the Rockets maintained their composure and pulled out a victory in a game I thought they were going to lose. And they did it with a bevy of big plays down the stretch as the Rockets recovered from a 3-point deficit with 1:23 remaining. First, after popping a wicked crossover that got him some daylight, T-Mac shot a jumper at the top of the key, which I thought was an ill-advised shot since I think he could have gotten a higher percentage one. But he drained it to make it 103-102, Clippers leading by one. Then on the very next Clipper possession, Rafer Alston had the biggest steal I have ever seen him get in his career. He stripped Daniel Ewing of the ball, drove it to the hoop and scored a layup at a somewhat difficult angle with 1:12 remaining in the game. That gave the Rockets the lead at 104-103, and Toyota Center erupted! That kind of thing just doesn’t happen to the Rockets, and doesn’t happen much in an NBA game for that matter. A steal to take the lead late in a game like that? I have bashed Rafer in the past, but I have to give him lot of credit on that steal. Yao gets attention from the Rockets medical staff after fracturing his right tibia Saturday night in Houston against the Clippers. Yao is expected to miss at least 6 weeks of action during a season where he had a legitimate chance to win the league MVP award. Click here for photos of Yao leaving Toyota Center on crutches. Like millions of Yao fans tonight, I’m completely depressed. Yao suffered a fracture of his right tibia and is out at least 6 weeks. I suffered a similar fracture in my left tibia almost 3 years ago, and it hurt like hell. I’ll never forget the pain and trauma inflicted on my knee that created the fracture. Ironically, I fell and landed right on some concrete steps at a Rockets-Warriors game. It hurt so much, I’ll never forget the day — March 19th. When I saw Yao rolling on the court in extreme pain, it reminded me of my own pain at the time. Looking at his reaction, I’m sure he’ll never forget it either. To recuperate, I had to rest as well as do some rehab work for the injury inflicted on my knee and tibia. What sucked was that I couldn’t run on it, and I quickly lost my cardiovascular fitness. I could still ride a stationary bike as much as I wanted, but it’s just not the same as running. I expect Yao will have a big adjustment period to get his conditioning back once he returns, hopefully right around the All-Star game break (February 18th). I was so looking forward to seeing Yao make a run at the MVP award this year. He could still do it if his recuperation period of 6 weeks stands, but the chances will be slim since the Rockets need to make the playoffs in order for that happen. Without T-Mac and/or Yao playing together, the Rockets will probably lose more games than they win, and that will most likely not cut it in the tough Western Conference. It’s like the Clippers gained confidence after Yao went down that they could win this game, and played knowing they could win. I was surprised the remaining Rockets still made a game of it, taking an 11-point lead in the first half at one point. Shane Battier took on a lot of the scoring load after Yao left the game, scoring a season-high 28 points. You have to love Shane — a player who doesn’t score much but does many of the little things needed to win — for being able to immediately turn on his offense like that when the team needs it. Not many guys can do that. The ultimate pro. Along with Shane, Luther Head chipped in with 22 (7-of-15 shooting) and Alston had 21 (8-of-20). But not having Yao in the lineup took its toll on the Rockets, who made only 14-of-40 shots in the second half. But the two guys who shot so well on Friday night – Juwan Howard and Bonzi Wells – made only 2-of-10 shots and 1-of-6 field goals, respectively. That’s just not going to cut it when the Rockets need all hands on deck hitting for a high percentage while Yao is out. 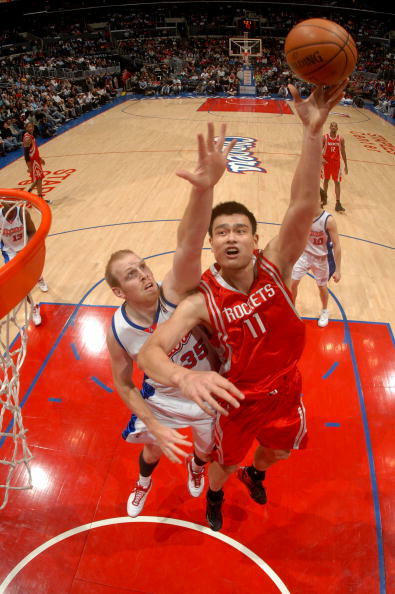 Click here for the Houston Chronicle story about Yao’s injury and the game. Just a few minutes ago in the first quarter Yao came down after trying to block a shot by LA Clipper Tim Thomas, and hurt his knee. Yao was in extreme pain holding on to his knee for a few minutes while writhing on the floor. I have never seen him in so much pain. Here’s what happened: Chuck Hayes was falling underneath him (he was charged into by Thomas), and as Yao came down his leg got hit by Hayes accidentally, making him land wrong. At minimum it’s a hyperextension, but by looking at the pain on Yao’s face, it looks much more serious. To add insult to injury, Hayes was called for a blocking foul when it was clearly a charge, sending Thomas to the line. The air came out of Toyota Center after Yao was helped off the court and into the locker room. But give the Rockets credit for keeping focused and maintaining a 23-22 lead after the first quarter. Yao lifts up over Chris Kaman Sunday afternoon on his way to pouring in 32 points on 12-of-18 shooting, 10 rebounds and a career-high 5 assists to lift the Rockets to a 108-103 victory to snap their 3-game losing streak. Click here for more photos. I know it might be getting old, but I just cannot believe how much Yao Ming continues to impress me. It takes a LOT for me to say that. Not since Hakeem Olajuwon have I had chills run down my spine like I have the past few weeks seeing what I have been seeing Yao do. With the Rockets’ season slowly turning into a big disappointment having lost their last 3 games they arguably should have won, Yao came out against the LA Clippers, said enough is enough, and came out and dominated once again with a 32-point, 10 rebound, and season-high 5-assist masterpiece to win it 108-103. And he did it while experiencing some stomach problems after eating something that didn’t agree with him in LA on Saturday. After the game, he joked the stomach problem may have helped him. But it’s not like he was struggling and needed something physical to whack him out of it, like T-Mac ‘s concussion a couple of weeks ago. I was lucky enough to go to the game in LA and witness his dominance in person. At first I was disappointed the Rockets didn’t come out and blowout a struggling 10-12 Clippers team, especially after losing in broken-hearted fashion against the Lakers, Warriors and Lakers their past 3 games. 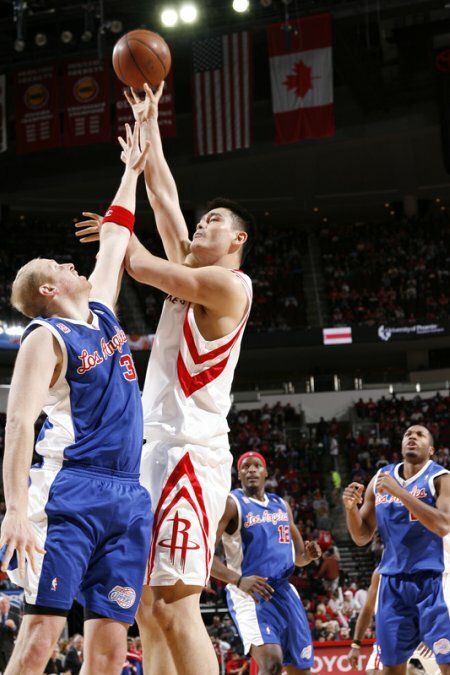 The score was only 26-26 after the first quarter, with Yao scoring 8 points on 3-of-3 shooting. I was hoping it would be something like 26-16. Yao’s first score came from a right-handed heave after jumping into the air, getting fouled by Chris Kaman, and banking it amazingly off the glass. It was a sign of what was ahead for Yao. In that second quarter, Yao scored another 10 points on 4-of-6 shooting, and Bonzi Wells finally got going – after missing his first four jumpers of the game – by taking it to the rack for a dunk. I said to myself, “it’s about time,” since I have felt Bonzi can get things going earlier if he doesn’t settle for outside shots. By halftime, the Rockets actually trailed by one point 46-45. But the way the Rockets had blown big leads recently, maybe it was good for them to be involved in a tight game where it would be harder for them to lose their concentration. One key stat that kept them in the game was an extremely low number of turnovers by halftime – only four (and 9 by the end of the game)! I don’t know what Jeff Van Gundy said at halftime in the locker room, but the Rockets came out in the third quarter and scored their largest number of points in a third quarter this season, a nice turn of events for once. Rafer Alston came out and took what the defense gave him – open 3-pointers since the Clippers were collapsing down low on him. He got hot and hit 3-of-4 treys to score 11 points in the third, giving the Rockets a somewhat comfortable 79-71 lead. Entering the fourth quarter, I had a sinking feeling that maybe the Rockets were going to squander this lead like they had done the previous two games against Golden State and the Lakers. After all, other than Yao, who else had stepped up in crunch time during their 3-game losing streak? It turned out to be a committee of four players: Yao, Alston, Juwan Howard, and yes, finally….Bonzi Wells. Rafer pumped in 9 points, thanks in part by taking it strong to the hole a couple of times with 3 minutes remaining to score on two consecutive possessions, including a sweet crossover move to get into the lane to put up a twirling hook shot. Until T-Mac is back, it’s aggressive moves like that which the Rockets need more of during clutch time, and for which I have criticized him in the past. Rafer finished with 26 points on 8-of-13 shooting, 3-of-6 treys, 7-of-8 free throws, 8 assists and only two turnovers. You have to give Alston a lot of credit for bouncing back after that 8-of-22 shooting, 7 turnover atrocity against the Lakers Friday night. I’ll get off his back if he gets a line like that every game. Yao scored six points in the fourth quarter, which is no surprise there. But his biggest basket came when the Rockets, only leading 100-96 with a little over a minute remaining, had to score to keep the Clippers from getting too close for comfort as they continued their run. Yao hit a huge fallaway jumper than silenced the crowd. Actually, it made them oooh and aahhh, which I love hearing in an opposing team’s gym when the crowd watches a great player making a back breaking play. The Rockets got lucky a couple possessions later. Leading 102-98 with a little over 30 seconds remaining, they were very disorganized and almost turned the ball over two or three different times on a helter-skelter possession, but were fortunately bailed out when Luther Head got fouled. Head ended up making 1-of-2 free throws to make it 103-98. After that, Rafer hit two free throws with 14.7 seconds remaining after being fouled intentionally, and that was essentially the ballgame. Other key contributors during the fourth quarter was Juwan Howard, who scored four of his 9 points in the quarter, including a baseline jumper with 2:09 remaining that gave them a 100-92 cushion. Last but not least, Bonzi scored 6 points in the fourth on 3-of-4 shooting, including a spot-up jumper where he was able to create his own shot, get an easy dunk after chasing down a loose ball in the backcourt, and a layup after getting a beautiful dish from Yao – a night where Yao created so much opportunity for his teammates that they didn’t squander. I have been to several arenas around the league, and I have to say the Staples Center is one of the best. Very clean and beautiful concourses. I had the good fortune to sit next to the Chronicle’s Jonathan Feigen for the entire game on press row. Jonathan really knows the game, and very personable, too. I got to know him during training camp in Austin. Classy guy. Yao and John Lucas were giddy in the locker room after the game about the day off they were getting on Monday. Yao sports a throwback warmup outfit Monday night before the Rockets game against the L.A. Clippers Monday night. Yao scored 25 points and grabbed 17 boards in the game, but the Rockets’ shooting went south again in the fourth quarter, leading to their fifth loss in a row. Click here for more photos from the game. 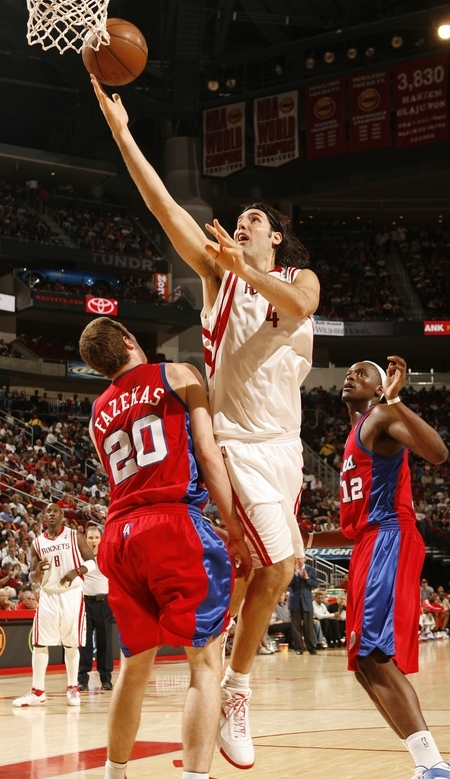 MONDAY, 3/20/06 – Don’t you love how ex-Rockets keep haunting their old team during a season they really could have used their experience and scoring punch? On Saturday it was Robert Horry with 12 points and two treys in a big Spurs win over the Rockets. Then you’ve got Toronto’s Mike James who has been making Houston’s front office look bad after trading him away last October for Rafer Alston (4-of-14 shooting Monday night). Fortunately, James plays in the Eastern Conference, so he can only haunt them twice a year. On Monday night, it was Western Conference players Sam Cassell’s (24 points) and Cuttino Mobley’s (14 points) turn, leading the Clippers to a 99-91 victory over the Rockets — Houston’s fifth loss in a row. Yao had a solid game with 25 points (7-of-16 shooting) and grabbed an incredible 17 boards. That makes for a 30-point and 12-rebound average over his past eight games. However, he did shoot 0-for-3 in the fourth quarter. The rest of his teammates didn’t do much better, making only 4-of-18 shots in the fourth. But Yao did make all five of his free throw attempts in the final quarter, and 11-of-11 overall. Nice. Juwan Howard has been winning some brownie points in my book, having another good shooting game Monday night, scoring 16 points and hitting 8-of-12 shots for the second game in a row. Probably the most encouraging sign is that one of the key players to Houston’s future – Luther Head – has been getting lots of playing time recently, playing his fourth game in a row with 40+ minutes Monday. In 46 minutes, Luther scored 20 points on 8-of-17 shooting, dished six assists, and had three steals. Not bad, Luther. Just keep it up, even after T-Mac returns to the lineup. Meanwhile, the Rockets made a major move by picking up a guy named Richie Frahm off waivers from Minnesota. What a great move for the Rockets that shows they are starting to think about their future…NOT! Frahm has played a grand total of 3 minutes and 28 seconds since January 10th! Add Frahm to the pile of other “no future” players the Rockets have picked up recently, like Rick Brunson, who admits he would rather be a coach than an NBA player. The Rockets now have 15 games remaining in a season we all can’t wait to end. Unfortunately, Houston has to play Dallas Tuesday night on national TV. Have mercy on them, Mavericks. You are currently browsing the archives for the vs. LA Clippers category.